Mars is a constant point of discussion for space explorers around the world. We’ve sent dozens of spacecraft there to study it. Some want to land astronauts on it. The planet is just far away to make that dream difficult, but just close enough to spark our imagination. So what are some of the most important things to learn about the Red Planet? We’ve been debating for centuries about whether Mars had life or not. In fact, the astronomer Percival Lowell misinterpreted observations of “canali” — the Italian word for channels — on the planet as evidence of alien-made canals. It turned out Lowell’s observations were hampered by poor telescope optics of his day, and the canals he saw were optical illusions. That said, several spacecraft have spotted other signs of ancient water — channels grooved in the terrain and rocks that only could have formed in the presence of water, for example. We’re very interested in the question of water because it implies habitability; simply put, life as we know it is more likely to exist with water there. In fact, the Curiosity rover’s mandate on Mars right now is to search for habitable environments (in the past or present). Mars has a thin atmosphere that does not allow water to flow or remain in large quantities on the surface, but we know for sure that there is ice at the poles — and possibly frosty locations elsewhere on the planet. The question is if the ice is capable of melting enough water in the summer long enough to support any microbes. For water to flow in the past, the Red Planet needs more atmosphere. So something must have changed in the past few billion years. What? It is thought that the Sun’s energy striking the atmosphere must have “stripped” the lighter forms of hydrogen from the top, scattering the molecules into space. Over long periods of time, this would lessen the amount of atmosphere near Mars. This question is being investigated in more detail with NASA’s Mars Atmosphere and Volatile EvolutioN (MAVEN) spacecraft. The surface gravity of Mars is only 37% of what you would find on Earth, which makes it possible for volcanoes to be taller without collapsing. This is why we have Olympus Mons, the tallest volcano known on a planet in the Solar System. It’s 16 miles (25 kilometers) high and its diameter is approximately the same as the state of Arizona, according to NASA. But Mars also has a deep and wide canyon known as Valles Marineris, after the spacecraft (Mariner 9) that discovered it. In some parts, the canyon is 4 miles (7 kilometers) deep. According to NASA, the valley is as wide as the United States and is about 20% of the Red Planet’s diameter. 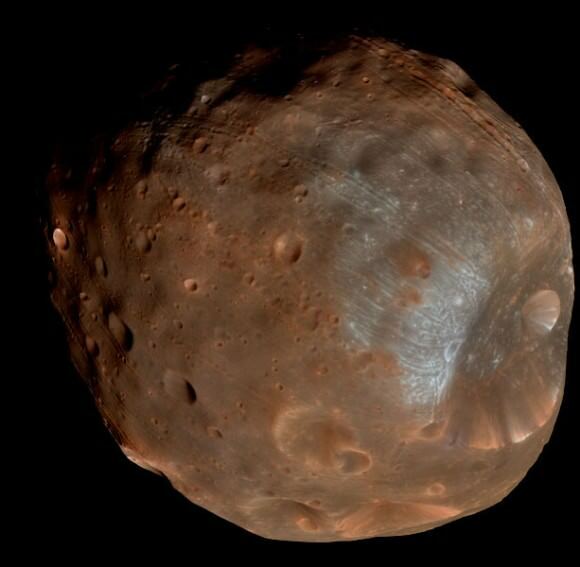 The planet has two asteroid-like moons called Phobos and Deimos. Because they have compositions that are similar to asteroids found elsewhere in the Solar System, according to NASA, most scientists believe the Red Planet’s gravity snatched the moons long ago and forced them into orbit. But in the life of the Solar System, Phobos has a pretty short lifetime. In about 30 million to 50 million years, Phobos is going to crash into Mars’ surface or rip apart because the tidal force of the planet will prove too much to resist. Remember the low gravity on Mars that we talked about? In the past, the planet has been hit by large asteroids — just like Earth. Most of the debris fell back on the planet, but some of it was ejected into space. That sparked an incredible journey where the debris moved around the Solar System and in some cases, landed on Earth. The technical name for these meteorites is called SNC (Shergottites, Nakhlites, Chassignites — types of geologic composition). Gases trapped in some of these meteorites has been practically identical to what NASA’s Viking landers sampled on the Red Planet in the 1970s and 1980s. There are a lot of unpleasant scenarios for somebody who took of their helmet. First, Mars is usually pretty cold; its average temperature is -50 degrees Fahrenheit (-45 degrees Celsius) at the mid-latitudes. Second, it has practically no atmosphere. The air pressure on Mars is only 1% of what we have (on average) on the Earth’s surface. And third, even if it did have atmosphere, the composition is not compatible with the nitrogen-oxygen mix humans require. Specifically, Mars has about 95% carbon dioxide, 3% nitrogen, 1.6% argon and a few other elements in its atmosphere. The early NASA probes that flew by the Red Planet all, coincidentally, happened to image spots on the planets that had craters. This led some scientists to (mistakenly) believe that Mars has an environment similar to the moon: cratered and practically unchanging. This all changed when Mariner 9 arrived at the planet for an orbital mission in November 1971 and discovered the planet engulfed in a global dust storm. What’s more, odd features were poking out above the dust — features that turned out to be dormant volcanoes. And as mentioned earlier, Mariner 9 found the vast Valles Marineris. It changed our view of the planet forever. Methane can be interpreted as a sign of biological activity — microbes emit it — or even of geologic activity. And active planets, it is thought, are more likely to have life on them. So the question of methane on Mars is one that scientists are trying to figure out. The consensus? There is no consensus. Telescopic observations have had wildly different measurements over the years, and few spacecraft have been designed to probe for the element in detail. The Curiosity rover has detected tenfold spikes in methane in its area, but we don’t know where it came from and why the fluctuations are happening. There have been so many spacecraft that attempted a Martian mission that it’s hard to pick notable ones in a short article. NASA’s Vikings were the first landers in 1976; in fact, NASA is the only agency that has managed to land on the planet so far. Some of its other missions include Pathfinder-Sojourner (the first lander-rover combination) in 1997, the Mars Exploration Rovers Spirit and Opportunity in 2004, and the Curiosity rover of 2012. And this doesn’t even mention the fleet of orbiters that have mapped Mars over the years from the Soviet Union, NASA, the European Space Agency and India. And there are many more spacecraft to come in the next decade. this was great~ thanks soo much. I agree, nice review. Thanks Elizabeth.